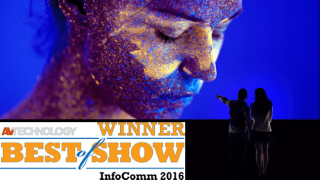 THE WHAT: An AV Technology InfoComm 2016 Best of Show winner, Sony’s new display system is re-defining the landscape for large-scale visual entertainment. The system features 99% black surface area for high contrast, high resolution, and immersive visuals. The new technology, Crystal LED Integrated Structure (CLEDIS), uses Sony’s ultra-fine LEDs in a unique surface mounting structure as its light source to deliver a visual experience not possible with even the highest-end conventional LED array. THE WHAT ELSE: This new type of canvas enables limitless flexibility and creativity in public spaces and high end visual entertainment. It is far more advanced when compared to the technologies currently available for large-scale display, offering a leap forward in depth, contrast, color, resolution and impact. The new display technology is designed for commercial applications and immersive experiences, from industrial product design and manufacturing, theme parks, museums, and high-traffic lobbies to corporate boardrooms and broadcast studios—any environment requiring realistic simulation on a large scale and detailed video displays. HOW DOES IT WORK? The self-emitting display technology uses R (red), G (green), and B (blue) ultra fine LEDs mounted on the display surface, with each pixel emitting light independently. Each pixel is only 0.003 mm2 in size, allowing the remaining surface area to be more than 99% black. This high black-to-surface ratio contributes to the technology’s high contrast ratio in light and dark viewing environments. The surface-mounted light source also improves light use efficiency. WHY THIS MATTERS: The scalable system is made up of multiple display units (each measuring 18 x 16 inches) that can be joined together with no bezels to create a limitless and seamless large-screen display. The canvas also features Sony’s unique pixel drive circuitry, to achieve fast video response with a frame rate of 120fps. This is critical for sports, concerts, or training simulations, where users need to present large screen visuals with no delay or motion artifacts. The technology has a viewing angle of nearly 180 degrees, with corner-to-corner image uniformity in terms of brightness and color, even on a large screen. The canvas has a brightness of 1000 cd/m2 (1000 nits), and will support High Dynamic Range (HDR) content, producing imagery with 10-bit color depth and a wide color gamut (approximately 140% of sRGB). An 8Kx2K, 32’x9’ configuration is planned to be available in early 2017.